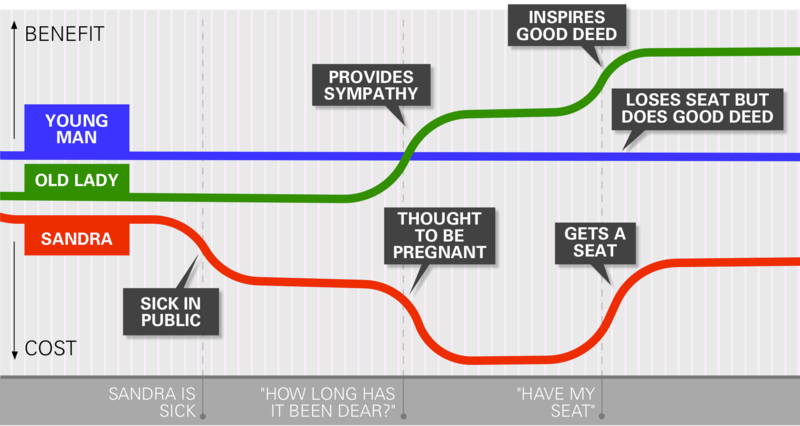 Last year I wrote a piece about the strategies commuters use to get seats on trains. I ended up appearing on a few radio programmes that portrayed me as an expert on the social rules of public transport, or at least someone who was unreasonably obsessed with that topic. So I’m heartened to hear about Esther Kim of Yale University, who has “chalked up thousands of miles of bus travel to examine the unspoken rules and behaviors of commuters” while working on a paper called Nonsocial Transient Behavior: Social Disengagement on the Greyhound Bus. And I thought I was brave to spend 90 minutes a day on an Overground train from Highbury to Kensington. Esther’s exhaustive research has truly put me in the shade. A friend once told me a story about her train journey. It was a short story but it had it all – hangovers, awkwardness, the elderly, pregnancy, puking, and the delicate diplomacy of the train seat. So obviously I felt compelled to pass it on. The story also contains a complex moral conundrum, a kind of Rashomon effect, that changes based on how you look at it. 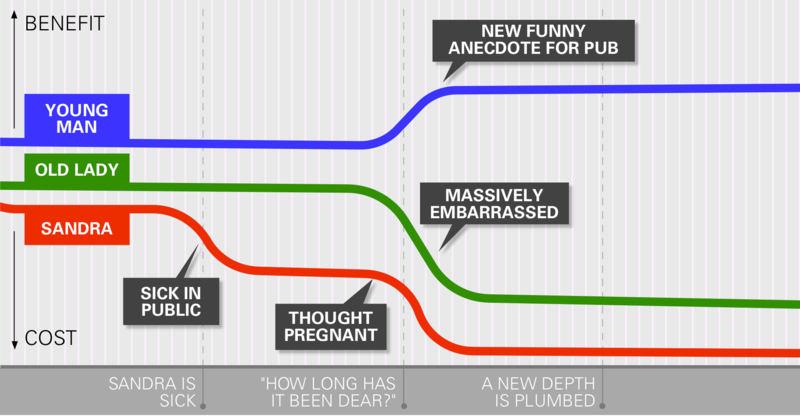 After the story I’ll go into it in a bit more detail and, in case you’re wondering, there will indeed be diagrams. My friend – let’s call her Sandra – was on an early morning rush-hour train to work. But the night before she had stayed out late drinking beer. Quite a lot of beer, in fact. So she was feeling pretty grim while clinging to the overhead rail on this crowded, stuffy, swaying train. Things got worse as the journey went on and before long she was fighting the urge to be sick. Eventually this urge got the better of her so she visited the toilet where nature took its course. Unfortunately nature wasn’t too discreet. Upon emerging from the toilet, it was clear from the looks on their horrified faces that the other commuters had heard Sandra vomit. Then an old lady sitting nearby looked at Sandra’s stomach, which was still slightly bloated by the aforementioned beer. She put two and two together and came up with five. The old lady thought Sandra was pregnant! Without thinking, Sandra decided to style it out. “Oh, about six weeks”, she replied while gently rubbing her belly. “It’ll get easier dear – trust me”, said the lady. Sandra smiled bravely. She thought the exchange was over, but it wasn’t. A young man sitting nearby suddenly stood up and offered up his seat. Once again Sandra did the easiest thing and kept her lie going. Thanking the young man, she sat down next to the elderly lady and, her hangover now mixed with a growing sense of shame, wondered what the hell had just happened. At first glance it seems that Sandra is in the wrong. Hangovers may be bad but we don’t give up our seats for those who overindulged the night before. Sandra’s deceit wins her a privilege she doesn’t deserve, so she’s obviously the villain. Right? The old lady actually receives a benefit through having inspired a good deed. And the young man’s seatlessness is offset by the benefit of having done a good deed. Yes, these good deeds were based on a lie – but does that matter? If Sandra came clean about not being pregnant, would anyone really be better off? Sandra’s honesty would have caused the elderly lady the deep embarrassment that comes with incorrectly assuming a woman to be pregnant – an embarrassment that was spared by Sandra’s lie. The awkwardness caused all round would have left everyone worse off, so maybe honesty wasn’t the best policy. While Sandra’s motivations obviously weren’t noble, her actions gave two people the chance to be good citizens and no-one suffered as a result. So did Sandra make the right choice after all? Or should she rot in commuter hell for what she did? My post about getting a seat on the Overground has got more attention than I had expected. Earlier today I wrote another piece about it which is live on the Guardian’s Comment is Free site and has triggered a bit of a debate already. Let me begin with a confession: I’m no good at getting seats on trains. I’m often the only person standing in the carriage, outwitted by my fellow passengers who sit smugly while I’m left to wonder just what it is they know that I don’t. You can read the full article and join the discussion here: Commuting: the seat acquisition game. Most commenters on last week’s Overground seat-acquisition strategy post shared nefarious techniques of their own – many of which made me feel like a bit of a novice. Please tell me youâ€™re not one of these awful creatures who get on trains whilst people are still getting off. As if! Everyone who knows their way around an Overground or Tube carriage understands that this is a cardinal rule, fundamental to the code of conduct. It’s shocking that anyone would even consider that. You see, even in war there are rules and ethics – and in this respect the strategic space of the train carriage is no different from any other modern theatre of conflict. And although there’s no International Criminal Court of public transport, there’s certainly a Geneva Convention. Here are three of its basic rules. It’s a beautiful thing when a load of commuters get off a train. No, seriously. Like herds of wildebeest sweeping majestically across the Serengeti or flocks of starlings rippling across the sky (this is a murmuration, fact fans), a crowd of Tube travellers surging on to the platform is a magical moment, particularly for those of us left behind who can finally breathe. So why try to stop it? It’s amazing that people still do this. You’d have thought that by now it’d be a forgotten social aberration, like bear-baiting or smoking in kindergarten. Maybe it’s tourists who do it? Or people on a combination of PCP and Special Brew? You’d have to be on something not to see that this causes problems for everyone, yourself included. The punishment: Transgressors can expect to be shoulder-barged or roughly pushed aside. You're getting near your stop so think about getting off. Will you make it through the crowd? OK, that person between you and the door seems interested in the exit. You'll just be able to coast in his wake. People who do this can spark off weird, instinctive responses in others. When we think we’re trapped, we’re like caged animals who stop at nothing to fight our way out, as if the next stop was Reading West rather than the tube station a bit further up the road. Still, it’s best to avoid triggering this primal rage, so don’t make people think you’re getting off when you’re not. The punishment: I’ve seen grown men scream swearwords at one another in situations like this. The Paris Metro has a surprisingly detailed set of rules that govern who should get a seat. Wounded soldiers are top of the list, and I’m not sure who sits at the bottom but it’s probably people who are pretty steady on their feet like gymnasts, ninjas or Shaolin monks. Everyone knows their place in the pecking order. But in London the rules aren’t as clear. The vague guidance is “people less able to stand”, which leaves plenty of room for interpretation and can cause problems. Some spritely senior citizens don’t take well to being treated like invalids by well-meaning youngsters, for example, and let’s not even get into the consequences of mistaking obesity for pregnancy. You need to strike the right balance between helpfulness and condescension. This particular rule has implications for the seat-fancier: securing the seat nearest the door can be a pyrrhic victory, because you might need to give it up again at the next stop. You need to go deeper. The punishment: Severe passive-aggressive disapproval from other travellers, loss of soul. The melee of the daily commute can seem like a lawless ungoverned space, but in reality all strategic machinations are underpinned by laws like the ones described here. And while there’s no International Criminal Court – no formal way to capture or charge transgressors, no lengthy trials in The Hague – one thing acts as a barrier between controlled warfare and outright savagery, a thin line between dignity and chaos. That thing, that barrier, is our intense fear of public embarrassment. Let’s cling on to it, because if we don’t, all is lost. A few days ago, on an Overground train from Highbury to Kensington, I had a shocking experience – I failed to get a seat. If you know how crowded the Overground can get at rush hour, this might not sound all that surprising. Believe me, though, I was good at getting seats. I’d learnt the ropes and tend to overanalyse behaviour on public transport, so it had never been a problem. But I’d been away for a few weeks and my seat-acquisition skills had gone beyond rusty – they were useless. So, as a form of therapy, I decided to try to work out the “rules” of the seat-acquisition game on the Overground. Here they are, in illustrated form. In a typical combat situation (or “rush hour”) here’s how the players might be distributed across the theatre of conflict. Civilians linger near the doors while Aspirants occupy strategic positions nearer the seats. I’ll come to these later. First, here’s an ill-advised opening move that could undermine your whole campaign. There are few seats here so chances of victory are slim. On one side you’re bordered by the crowded doorway, on the other you’re hemmed in by the barren, seatless inter-carriage zone, so withdrawing to another region could prove impossible. Stay well away. Having found your spot you’re now engaged in a tactical skirmish with other nearby Aspirants. This will play out in a smaller and more manageable space. Things might seem straightforward from now on – someone will get up, you’ll sit down, mission accomplished. But it’s still too soon for complacency. This might be the end of your campaign if earlier strategic decisions were sound and luck’s on your side. Other passengers, however, play by their own rules, so there could be some surprises ahead. Here are some end-game scenarios and how to handle them. The Occupant of a contested seat puts their book away. Suddenly you’re interested in nothing else, watching them like a hawk to be sure you’ll bag their seat. Distracted, you fail to notice a seat that is legitimately yours becoming empty. An opportunistic Aspirant sneaks in to grab it. Then, to compound your error, the Occupant you’re eyeballing just sits there looking like butter wouldn’t melt in their mouth and you’re stuck on your feet. You lose this round. Don’t let any single Occupant claim your undivided attention – sometimes people put their books away because they’re bored of reading, they want to sleep, or they simply enjoy messing with your mind. It’s easy to get a kind of tunnel vision when staring at the same three or four people for so long. You can easily forget that there’s a whole other row of seats immediately behind you. So when a seat behind you becomes vacant, will you be quick to notice? If not then it’s a lost opportunity. The trick here is to somehow know what’s going on behind you without overtly gawping – remember your Sun Tzu. As always on the Overground, subtlety is essential. Imagine two Aspirants have equal claim to a seat and the Occupant gets up. Who wins? Sometimes it’s about who acts smartest, not who acts first. The departing Occupant decides which door to head towards. Sometimes it’s the nearest door, but on a crowded Overground carriage they’ll usually choose the path of least resistance. Exploit this to your advantage by shifting your position to create an easy route for them. As they move past, do that “orbiting” kind of motion that people do in busy spaces, spinning around them so you switch places while gracefully intruding between the seat and your thwarted enemy. Get it right and you’ll effortlessly drop into their seat while looking like a helpful and polite person, and not the scheming and conniving seat-fancier you are. This guide should help you achieve comfort on the Overground, but I must confess that my last few journeys have been spent standing up, so maybe I’m not the best teacher. Maybe I’ve lost the hunger, the brutality, the sharpness of wit that’s needed to compete on these trains. The truth is that I don’t need that hunger any more – my company is moving next weekend, to an office 20 minutes’ walk from my house. I’m pretty happy about this. So while my days as an Overground commuter are over, yours may be only just beginning. If so, be careful out there – and don’t let the war for seats escalate any more than it has to. Enough blood has been shed. To get to work I usually take the London Overground train from Highbury to Kensington. It’s part of a rail line that orbits central London around four miles out, allowing people to move around the city while remaining within urban areas and steering clear of the centre. It spares me the ordeal of travelling through central London at rush hour, so I’m really glad it exists. Most people only take one regular route, so may not notice the behavioural patterns that fleetingly bond them to their fellow travellers. But I’ve recently started taking another regular route, down to the City of London, which has got me thinking a lot more about this. It’s a far shorter commute for me, only two stops. It’s also a more conventional “spoke-to-hub” commute: the route begins outside London and bores its way inwards to stop at Moorgate, in the city’s central zone. 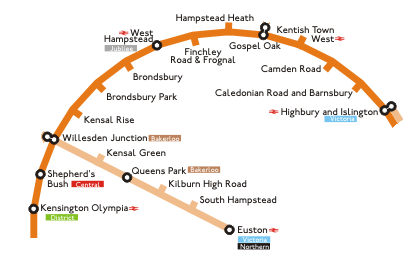 This is in stark distinction to the radial nature of the Overground route. Over time I’ve started to notice how the patterns of the City community differ from those of the Overground. The most significant difference relates to overcrowding. The City community arrives at Moorgate, within walking distance of any office in the City, so many might never have to use the Tube. On the Tube, the authorities run frequent poster campaigns about how to behave – if they didn’t, the Tube (with its mixture of commuters, shoppers and tourists) would be sheer chaos. The Overground community is exposed to these campaigns but the City community, spared the ordeal of Tube travel, isn’t. My stretch of the City commute is underground so people don’t use mobile phones. This contributes to the oppressive silence: speaking aloud marks you out as a lunatic. But on the Overground, there’s a constant background babble of phone chat, which means it feels less strange to call out to other travellers. Everyone on the Overground is moving from one urban district to another, so most people have an “urban” rather than a suburban approach to personal space and group behaviour. They’re accustomed to being told to move on, get out of the way, budge up and so on. These are only part of the story however. What these two communities have in common is that they exist only at rush hour, have highly transient memberships, and revolve around simple, unspoken rules of personal conduct. But they diverge from one another when it comes to behavioural patterns, for reasons that are numerous, complex and hard to fathom.